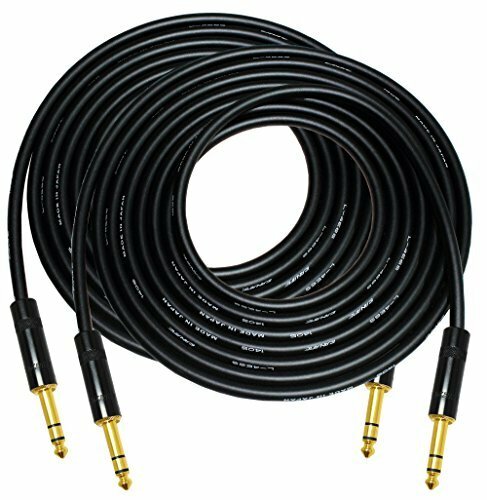 2 Units - Custom Made - 10 Foot Canare L-4E6S Star Quad, Patch Cable terminated with Neutrik-Rean NYS ¼ Inch (6.35mm) Gold TRS Stereo Phone Plugs (this sale is for 2 cables, each cable is 10 foot long). Canare L-4E6S by Canare Electric Co., LTD-Japan is a premier (21 AWG) ultra-durable Star Quad audio cable for high-end audio applications. 40 separate strands in each conductor results in improved strength & flexibility even in extreme cold weather. The Star-Quad design reduces almost all EMI noise. Superior sonic performance for professional audio users as well as discerning Audiophiles who cherish sound quality as well as durability that Canare is well known for all over the world. Canare manufactures the best in Pro Audio and Video Cable, Connectors and Tools required for Audio/Video applications. Founded in year 1970, in Nagoya Japan they have been fulfilling the needs of professionals for over 4 decades. Professional broadcast engineers, sound technicians, A/V facility integrators, design consultants, audiophiles and many leading OEM's rely on Canare's product, proven reliability. Optimize with Canare ...the Professionals Choice! The Neutrik-Rean NYS228-BG 6.35mm TRS, 3-Pole plug with 24k Gold plate and Black body is a top performer for professional and everyday use applications; offered by Rean a Neutrik AG Company. The contacts are made of Brass and plated with pure Gold to enhance conductivity. Thermoplastic insulation is included to ensure no shorting occurs inside the connector. The black Zinc diecast shell guarantees reliability and ease of use. Operational temperature range is -20 °C to +70 °C. This sale is for 2 individual cables, each cable is 10 foot long.